It’s not impossible to describe what driving a Ferrari as ferocious as the 488 GTB around a big city like Dubai with Speed Scanners on every corner is like, but If I were talking to you in person I would make primitive grunting noises, wave my hands rapidly in front of you and produce facial expressions of comical awe and frantic fear. But I’m not, so we resort to numbers – 493kW, a zero to 100km/h time of three seconds exactly, a twin-turbocharged V8 (which is a hard thing to swallow for naturally aspirated super-car purists). But one number beats them all – 8.3 seconds. That’s how long it takes a 488 at full, fulsome noise to go from a standing start to 200km/h, a figure made even more astonishing by the fact that it’s more than two seconds quicker than the already amazing 458 this car replaces. 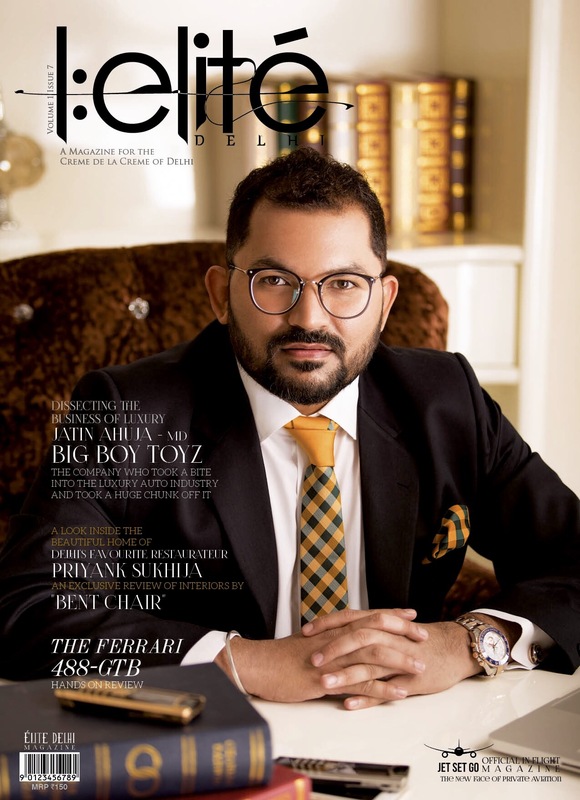 Truly, we are in a whole different territory, in every aspect, from performance to price to prestige, which makes it fitting that we drove it in the wholly unusual controlled & uncontrolled surroundings of Dubai. Whichever angle you look at it from, the Ferrari 488 GTB is an amalgam of sculptured shapes dictated by aerodynamics and art’s sake. Not only does each and every panel underscore the sportiness you would expect from a high-performance machine, but the air intake scallop harks back to the 208 from the 1980s. The retro styling cue is no coincidence because the old-school 208 series started the turbocharged revolution for road-going Ferrari models. 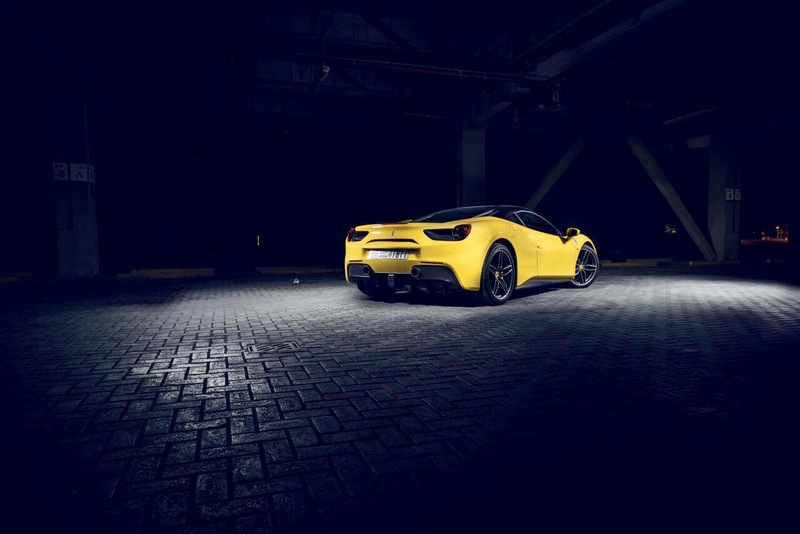 Compared to the F40-inspired triple exhaust system of the 458 Italia, the 488 GTB sports two tips that are flanked by a third brake light located bang in the middle of the rear bumper, reminiscent of the rain light on a Formula 1 car. Through the midsection, the air channels are completed by intakes that are partitioned across the middle. That’s not the typical Italian flair most of us expect from a car, but a design concept dictated by the 3.9-liter twin-turbo V8 engine’s needs. The upper partition has two roles: feed air to the twin-turbo system’s intake, as well as to direct air alongside the taillights to increase air pressure behind the car in order to reduce drag. The lower partition, on the other hand, is used by the engine’s intercoolers for the sole purpose of cooling the intake charge. Despite the high-tech paraphernalia incorporated into the 488 GTB’s exterior design, this Fezza oozes sexiness. From an automotive designer’s point of view, that’s a hard trick to pull off. Once you hop inside the cabin of the Ferrari 488 GTB, you’re immersed in a driver-focused cockpit inspired by the Prancing Horse’s extensive F1 expertise. 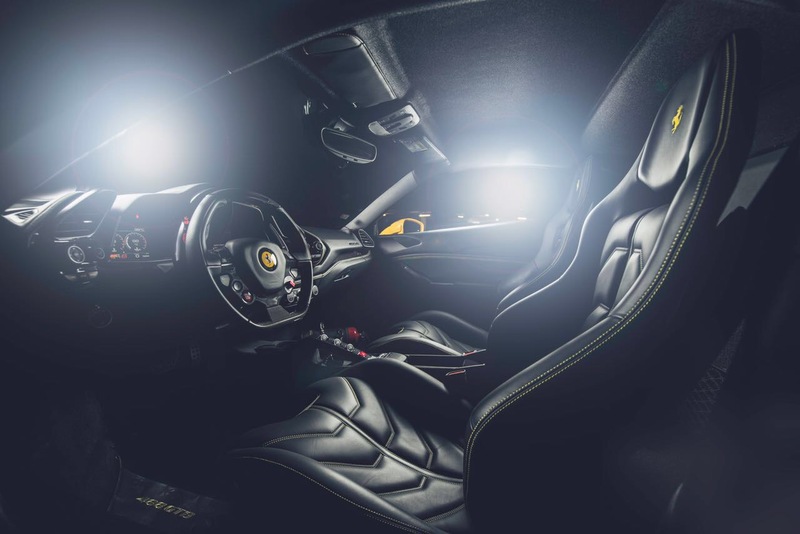 Inside the 488 GTB, the driver feels as if he is cocooned, not seated. An even more surprising characteristic is that shoulder room is plentiful for two adults. Furthermore, unlike the Lamborghini, it’s pretty easy to get in or hop out. The area where the Ferrari 488 GTB differs most from other cars, as well as other supercars, is the infotainment system. Fortunately, there’s no tacked-on touchscreen like those one might find in the Benz. Instead, the designers decided to integrate the infotainment system into the instrument cluster, thus furthering the driver-focused feel you get from the 488 GTB. Even though that translates to no touch-sensitive screens whatsoever, the user interface for the system is effortless. When it comes down to roominess, the 488 GTB is as good as a mid-engine supercar can be. There’s enough space for a couple of soft bags behind the seats. In addition to the padded shelf inside the car, the forward trunk offers 8.12 cubic feet (230 liters) of cargo capacity. The coolest piece of tech in any high-performance exotic is the telemetry system. Just like a Formula 1 car, the 488 GTB’s telemetry system can record and analyze the behavior of the vehicle. Dubbed Ferrari Telemetry, the system monitors the 488 GTB’s position and performance and displays the data in the instrument panel. It can also give you tips to improve your lap time, by analyzing braking points or speed out of corners. All data recorded can be transferred to a USB stick and you can further examine it on a PC, iPad or iPhone using the Ferrari Telemetry App. The Italians have revised the infotainment system as well, albeit Ferrari has kept the display integrated into the instrument panel, like it used to be on the 458 Italia. A new graphic interface will greet the user of the Harman-developed infotainment system, which features Digital Audio Broadcasting, Bluetooth audio streaming, Apple CarPlay, and speech-to-text or text-to-speech functions. For the audiophile inside every one of us, a premium JBL sound system can be specified. It features 12 speakers and a 1280-watt, 16-channel amplifier, plus QuantumLogic Surround. The business end of the 488 GTB is the 3.9-liter V8 twin-turbo heart. It’s good for 661 horsepower (670 PS) at 8,000 rpm and 561 lb-ft (760 Nm) of torque at 3,000 rpm. For a manufacturer with such a rich heritage, so much performance from so little displacement speaks volumes about this car’s capability. With the help of a 7-speed dual-clutch transmission manufactured by Getrag, the 488 GTB is capable of hitting 62 mph (100 km/h) in 3 seconds dead and 124 mph (200 km/h) in 8.3 seconds. Top speed is listed by Ferrari as being over 205 mph (330 km/h). That’s more than the F40 and F50, which is a rather impressive deed for this price point. Borrowing some tech from the LaFerrari, the 488 GTB is fitted with carbon-ceramic brakes. This means a reported reduction of nine percent in stopping distances compared to the 458 Italia. The 488 GTB also uses active magnetorheological dampers and variable torque management to keep things nice and steady when the going gets twisty. Using the patented Manettino switch on the steering wheel, the driver can adjust the behavior of the vehicle. Wet, Sport, Race, CT Off, and ESC Off are the available modes. As an overall package, the 488 GTB isn’t just a sea change meant to upset purists. It is an interweave of substance and style. The eminence of this Ferrari comes from how the team behind it melded brand attributes with the newest automotive engineering marvels to create one of, if not the best supercar on sale today. The turbocharging fits the 488 GTB like a hand in glove, chiefly because this segment is all about pushing the go-faster envelope as much as possible. The rowdy sound produced by the naturally aspirated engine in the 458 Italia is dearly missed, but on the flip side, the engineers have done their very best to create an intoxicating soundtrack from the force-fed V8. The harmonics, the tonality, everything has been masterfully calibrated to create aural delight. And in typical Ferrari fashion, the 488 GTB is a pussycat at low speeds, a gentle cruiser that doesn’t miss a beat when pottering around town. On the other end of the spectrum, it’s an exhilarating driving machine that can wiggle its tail like an overexcited puppy. But drive it, as hard and fast as you dare, and you will quickly realize its talents are more than skin deep. There is a thoughtfulness, an intelligence, a cleverness about this Ferrari that is mesmerizing. And it is all down to the details.